Sometimes what works great is to simply know the behavior patterns and be a half step ahead. Then you can “feed the child the words” to try and get their needs met. For example, you see a child about to grab a toy so you say, “Tell Michael, ‘I want the red truck.’” Don’t worry about the fact that you know Michael is not about to give up the truck. We’ll get to that later. We still need to give the truck-grabber the words to express her desire. Then, when you see a child upset you can simply say, “it looks like you are really mad” or “Michael, you can say, ‘I’m so mad!’” This can be tremendously helpful and empowering for children. IMPORTANT: make sure to label a range of emotions and to do this for all children. We don’t want the children who exhibit challenging behavior to get typecast as being angry all the time! 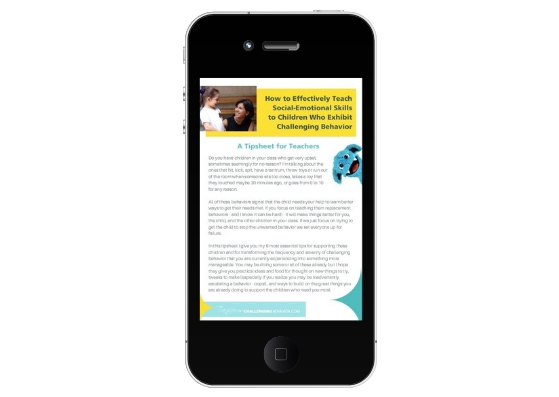 These are just a few of the MANY things you can do to help children learn important social-emotional skills like identifying and expressing their emotions, needs and desires. Download the Teacher Tipsheet I just created for you and then let me know which of these strategies you are already using or any new ones you're going to try in the comments below. I'm always interested in your questions, challenges, stories of success! Newer PostNever Enough Help With Classroom Transitions!